Why Do Healers Hurt Themselves? I would love it if you were able leave a review if that is possible as this will help me with future sales 🙂 I am still having issues with the formatting and the quote is at the top of the page instead of in the centre of the page. This is something I am trying to work on and I would really appreciate any feedback you have on if this is to distracting or if you found it easy to read. Today has been more about finalising things. 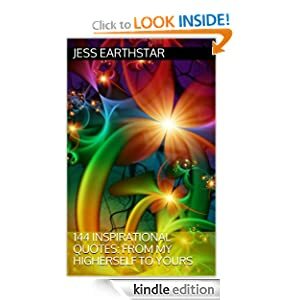 Months ago I started writing down quote that I get while meditating, I have also wrote on this blog that I got a title that I wanted to use – 144 Inspirational Quotes: From My Higherself to Yours. Today I counted how many quotes I have (#93) and I also created the front cover, its very simple and basic, but that is just what I wanted. I have the feeling that I will have this ebook finished and published before my Singapore trip. I don’t really know why I am that confident, I guess its just a more certain feeling I have been getting. I also put up one of my quotes on Facebook, I even found this cute little lady bug picture to go with it. I got alot of simple joy out of making something creative. Once again today I have been feeling a level of distance with a few people and I think my ego wants to make an issue of it but then it cant. I really have trouble describing the feeling, yes I am emotional and still love these people but I feel like there is a level of detachment now. I feel almost like I have a strange obligation to feel some kind of negative emotion, like I should be offended or worried etc I am just observing these thoughts and the moving on. Health wise I still have a few ear problems and alot of tissues are still being used (TMI) but I am confident that I will be well by next Monday so I can travel. I am beginning to enjoy this essence, my first week was almost a blur with the cold but now I am feeling a rise in my confidence.